Get 20% off your first order with Naro. Click here! What Do Antioxidants Do? And Why Are They Important? You’ve been told that you should eat more blueberries, kale, and green tea because they’re antioxidant super foods. But what do antioxidants do, exactly? You may already be supplementing your diet with antioxidant-rich foods and supplements like berries, green leafy vegetables, and more. But do you actually know what an antioxidant is? What do antioxidants do? To give you a better understanding of how these disease-fighting compounds keep you healthy, let’s start with a discussion of free radicals and oxidative stress. Free radicals are highly unstable molecules produced naturally as a byproduct of chemical reactions in our cells and also when we are exposed to toxins. Free radicals are formed when the food we eat is converted into energy, when we exercise, and when we are exposed to things like sunlight, cigarette smoke, radiation, or pollution. Electrons typically come in pairs. Free radicals contain unpaired electrons, which is what makes them so unstable; they will wreak havoc to steal the electrons they need from other molecules. In doing so, they can cause significant damage to cells in the body and can set off chain reactions of what is termed oxidative damage and oxidative stress. Once one free radical is formed, it creates a domino effect, creating many more free radicals as a result. Free radical formation is normal. Plants, animals, and humans produce free radicals all of the time. Our bodies have defenses against free radicals, but when the strength of these defenses are outweighed by the amount of free radicals themselves, they can cause lasting harm, and even cell death. Oxidative stress on the body can damage DNA, leading to cancer; compromise cell walls, allowing substances into the cell that aren’t supposed to be there; and make LDL-cholesterol stick to blood vessels, causing atherosclerosis. Oxidative damage has been linked to several diseases, including cardiovascular disease, Alzheimer’s disease, and cancer. [1,2] So how can you help your body to prevent these devastating effects of free radicals and oxidative damage? The answer lies in antioxidants. Antioxidants come in many different shapes and sizes, but the quality they all share is that they are able to neutralize free radicals, preventing them from damaging the body. They often act by donating electrons to free radicals, making them more stable. They also can degrade free radicals, rendering them harmless. Whatever the mechanism it uses, an antioxidant helps protect the body from damage by interrupting the deleterious effects of free radicals and the chain-effect of oxidative damage that they cause. In essence, the benefits of antioxidants are to properly detoxify the body of these harmful molecules. Some antioxidants, such as the compound glutathione, are produced by the body to naturally defend against oxidative stress. Others we get through diet, such as vitamin C and vitamin E.
There are numerous foods with antioxidants that benefit our health, including polyphenols from berries, carotenoids from sweet potatoes, resveratrol from grapes, and more. Oftentimes, the most colorful foods have the most potent antioxidants. 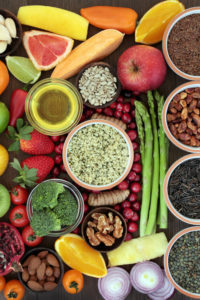 Now that you know why antioxidants are so important to your body, be sure to keep loading up your plate with foods high in antioxidants such as fresh berries, green leafy vegetables like kale, green tea, vitamin C rich bell peppers, vitamin E rich sunflower seeds, and other antioxidant powerhouses such as artichokes, dark chocolate, pomegranates, cinnamon, and nuts. What are antioxidants that you like to incorporate into your diet? What are your favorite antioxidant foods? Do you have any experience with antioxidant supplements? Share your tips in the comments section below.